From Home Dental Kit is the industry leader in the proven 2-step ordering process. We do not require you to buy your teeth device up front. You ONLY pay for the impression kit first and can order the teeth device of your choice when you are ready. We know buying dental devices can be expensive and we can help by offering our affordable custom 2-step ordering process. Order your teeth impression kit today! You will receive a teeth impression kit in the mail with complete impression taking instructions and enough supplies to take a practice impression. Take your teeth impressions and forward photos of them, for approval, from the Contact Form on the Contact Us page. When we approve your teeth impressions, you will receive a link to the website where you order your desired custom teeth device. 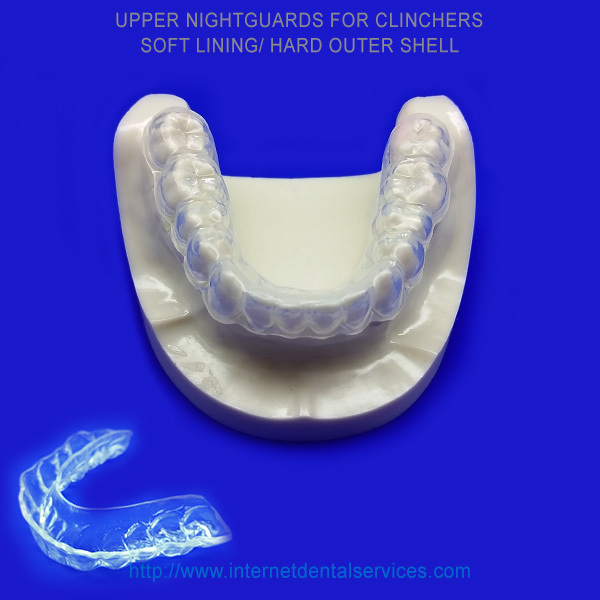 Our Night Guards for Clinchers start at ONLY $129. The Dual Layer Nightguard is for those people that have a clinching problem and not a grinding problem. For grinding, our Hard Acrylic Nightguard is the perfect product. The Dual Layer Nightguard is made of a softer inner layer of plastic covered with a hard plastic outer shell thus called a “dual” layer. This teeth device is more comfortable than the Hard Acrylic Nightguard and is all that is needed for those people that clinch their teeth together. When you order our Dual Layer Nightguard you will receive our teeth impression kit within 2-3 days. After you create your impressions and send them back to us in our prepaid mailer, it takes 10-12 days to manufacture your product (the same time as if you had gone to a dentist). These are the same high quality products that are made by laboratories that dentist use, for close to half the cost. The Dual Layer Nightguard can be worn 24 hours a day but only needs to be worn when most of your clenching occurs. (This is usually at night when you are sleeping). To insert or remove this teeth device, use both hands and push on or pull off evenly with your thumb and index finger. It may take several days for your tongue to get used to device and then your speech will return to normal. To clean the Dual Layer Nightguard simply brush it with toothpaste and water after each use.